Palazzo dei Ciompi formerly “Palazzo Pascolutti- Giani” is a 19th Century building composed of 21 completely renovated apartments. In the building there are two modern elevators to get to the apartments. In front of the building there is car parking for about 12 cars. In the building hall there is a reception area to receive and assist guests. Every apartment has central heating, air conditioning telephone and separate connections for internet and satellite TV. 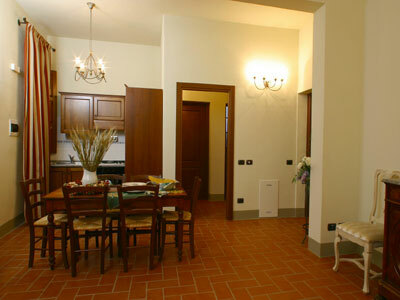 There is also a fully fitted corner kitchen which included cooker, oven, dish washer and fridge. On the second floor there are washing machines and tumble dryers at guests’ disposition. The building is found in Via Pietrapiana where the road meets Piazza Ciompi. In this very noble square, where the Ghiberti family lived, there is “Loggia del Pesce”, designed by Vasari simple and straight in design and composed of 18 thin Doric columns with a variety of small round terracotta fish. In Piazza dei Ciompi there is probably the only fixed flea marked in Italy, open every day, morning and evening. There it is possible to find old lamps, books, bijou and various objects from the recent and distant past. Every last Sunday of the month the market becomes larger by about another 100 stalls distributed in the streets around the Piazza. Palazzo Ciompi is located in the centre of the old city about 150 metres from the square of “Santa Croce”, 350 metres from “Piazza del Duomo” and about 500 metres from Via Tornabuoni. In Piazza dei Ciompi there is probably the only fixed flea marked in Italy, open every day, morning and evening. It is possible to find old lamps, books, bijou and various objects from the recent and distant past. Every last Sunday of the month the market becomes larger by about another 100 stalls distributed in the streets around the Piazza. Palazzo Ciompi is found in the centre of the old city about 150 metres from the square of “Santa Croce”, 350 metres from “Piazza del Duomo” and about 500 metres from Via Tornabuoni. Low Season: 13/Jan - 01/Mar; 03/Nov - 20/Dec. High Season: 28/Mar - 06/Jul; 07/Sep - 02/Nov; 21/Dec - 10/Jan/2014.